It is difficult to combine film spectral response with filter responses when their data is presented in different formats. For example, film spectra are presented using log scales for relative response, filter data uses linear scales. Manufacturers give wedge spectrum measurements using a variety of light sources. Ilford uses tungsten light sources at 2850K or, in the case of one Kodak/Ilford document, equivalent equal energy sources. Fuji use 5400K which is close to flat, Kodak appear to use flat equal energy sources. Note, for reference, the graphs show the response of a modern high quality silicon blue cell, the BPW21, used in light meters and the standard eye response. This blue cell is the most accurate sensor for photographic purposes that I have found. Each filter and film is normalised to give a value close to 0 in the mid green region. 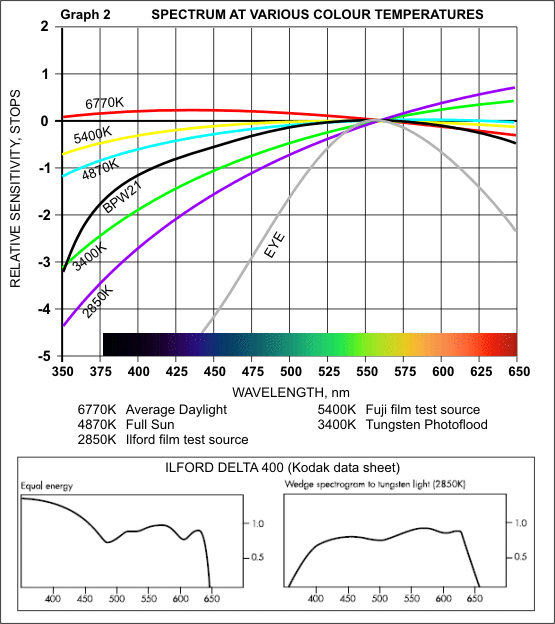 The original Ilford data for Delta 400 is reproduced at the bottom of Graph 2 for both tungsten light source and an "equal energy" source. In Graph 1, note the increased response to blue in Ilford films when compared with other manufacturers. The reason for Ilford adopting an essentially flat response with tungsten light, at the indicated colour temperature, is difficult to understand. 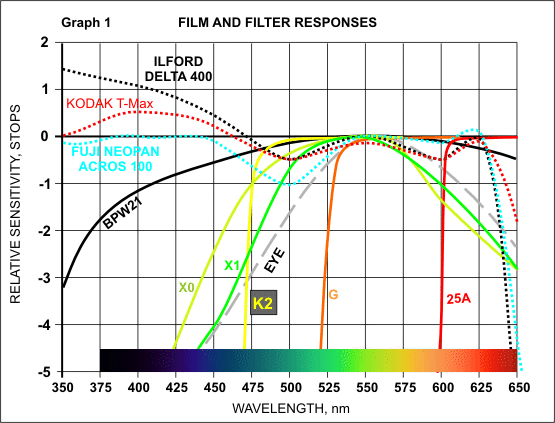 Another interesting point is that if film is required to approximate the eye response, an X0 filter is recommended. However in the blue region, it looks like the X1 filter gives a better fit than X0, so why is X0 normally recommended ?